EarthWorks can help you bid them 5x faster! Want software that's easy to learn? A clean design, large icons, on-screen prompts and 5 hours of built-in training videos gets you productive quickly. Bidding from different types of site plans? 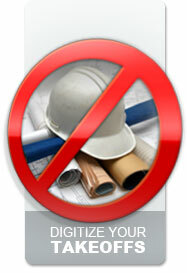 EarthWorks allows you to do takeoffs from paper plans, PDFs, TIFFs and AutoCAD files. NEW: Now import directly from Vector PDFs. Need software that won't break the bank? It has many of the same features of other software products costing thousands more. We offer lower yearly maintenance cost too! Since 1992, EarthWorks has been used by thousands of companies around the world to give them a competitive edge. In a tough market, you need excavation software that gives YOU the definitive advantage. EarthWorks Excavation Software allows you to do takeoffs up to 5X faster than the traditional "by-hand" methods. Using paper plans, PDFs or TIFF files, you can trace in your existing and proposed elevation information from your grading plan or you can simply import it from your Vector PDF or CAD drawing. Once the drawing information is entered, you can calculate your excavation quantities in seconds. EarthWorks calculates your cut/fill, topsoil, overexcavation, engineered fill and building materials quantities for the site. Once EarthWorks has calculated your take-off you can access many different views of the site, such as a cut and fill view, and check your work to make sure that the quantities that are generated are accurate and complete. And...EarthWorks is as affordable to own as it is to buy. At Trakware, we work hard to keep your support and upgrade costs low. Upgrades are also more affordable than other software packages and are not additive, so if you don't upgrade for a couple of years you are not hit with a huge cost when you do choose to upgrade. With EarthWorks you can stop stressing about a lack of time, bidding errors, or your competitors! To sign up for an online demo, click here!